w o o d w o r k i n g. b o w m a k i n g. k n i f e m a k i n g.
Well, like the title says, I'm building a portable raised garden bed. Best of all, it's simple to make and super easy to move. It's the ideal urban garden solution. Let's get started! If you don't have a chop saw like me, you can head over to your local big box store and get your wood cut. They're not super precise, and they charge about 50 cents per cut, but for our purposes the precision is good enough—and if it's your only solution, you have to do with what you got. I used this plan for a raised garden bed as a template, and customized from there. I'm making a bed that's about 3' by 4' (or 36" by 48"). The structure is also going to be 3' high, and the actual bed, 14" deep. It has been a long time since I last posted. In fact, I already finished the burner many months ago. However, I thought I'd show you all how it works/looks. It's really hot here in Arizona, so I can't forge until winter time. Here I already drilled the hole at the top of the "T". 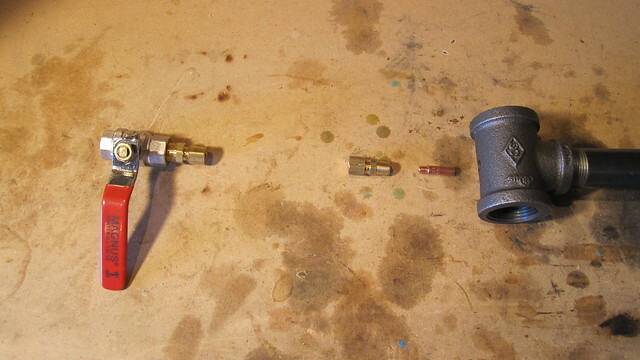 I also attached a brass piece that I had in a box of fittings. I'm not sure what it is, exactly, but I kind of acts like a flare and enables me to attach the burner to the hole in the firebrick. These are two different compression fittings. The top one is 1/4" MPT x 1/4" compression. 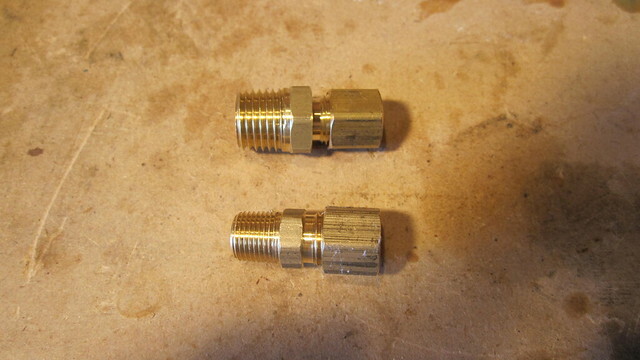 The bottom one is 1/8" MPT x 1/4" compression. Why? Scroll down. 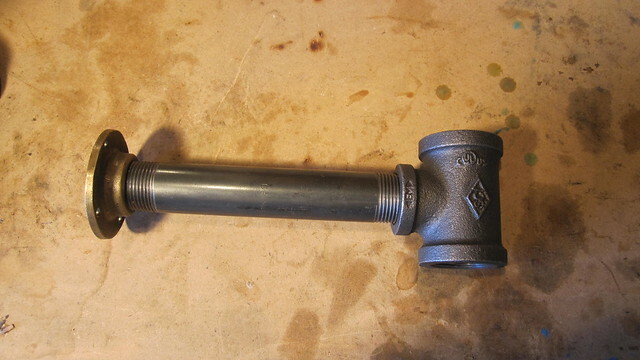 Can't wait to get this burner up and running... building the forge should be the really easy part. Going on partial 2-week break from school. Meanwhile, I'm setting up my shop for blacksmithing. A really nice knifemaker gave me a piece of railroad track for an anvil. He also gave me some ceramic high-temperature Kaowool to line my gas forge, and a few pieces of high-carbon steel. So I decided to embark on splitting a log of sweetgum I had sitting in the garage for a few months to make a bow. It was going to be hard, but I didn't expect this much work. Took me about 3 hours. Right now, I sit exhausted in my computer chair typing. I'm taking advantage of the (hopefully) last week of high 90s to dry the de-barked log. It's going to be a flat bow--possibly Mollegabet design. Notice, in this picture, that the thin limbs that bend but the last 4-5 inches at the tips do not. This design (modeled after a bow design found in a village called "Mollegabet") is a very fast design (shoots fast). Wider and thinner limbs (around 2 inches wide); and narrower and thicker tips (about 1/4" wide and 1/4" thick I'm pretty sure). Well anyway, here are some pictures of splitting and de-barking with the really useful draw knife. In case you were wondering, I used the butter knife to de-bark the wood. Drying the elevated half because that's the one I'm planning on using. Next week I'll probably take the 14" bandsaw to it and split it in half down the its length.